From an author The Queen called "a humorist of the first order" comes the deliciously dark tale of the strange and woeful young womanhood of Margaret, the narrator of Elizabeth Eliot's debut novel, and her friend Alice, from their final year at boarding-school in the late 1920s until just before World War II. The girls have adventures at school, are presented at court, and experience the vicissitudes of high society and their eccentric, increasingly impoverished families. Alice marries, unhappily, and involves Margaret in her hardships, until she suddenly decides--with fabulous success--to become an actress. And through it all the young women engage in loopy existential ponderings about their fates, gleefully detailing the radical instability of their world. Anxious characters marooned in a world without safe harbour--a tragic circumstance, but, in Eliot's hands, an absolutely hilarious one. 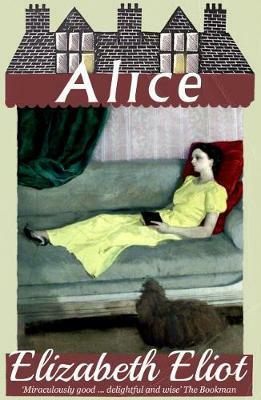 Evoking by turn the morbid humour of Barbara Comyns and the high society sorrows of Rachel Ferguson, Alice is very much its own brilliant confection. Furrowed Middlebrow and Dean Street Press also publish three of Eliot's later novels--Henry, Mrs. Martell, and Cecil--all back in print for the first time in more than half a century. They all feature a new introduction by Elizabeth Crawford.